The humble potato actually has a lot going for it. The starchy tuber tastes great baked, mashed, roasted, scalloped, grilled, and, of course, fried. 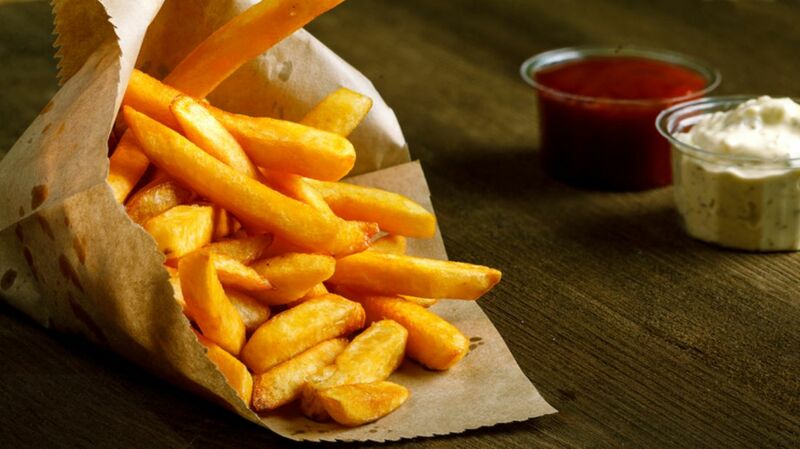 Whether they're double-fried, oven-roasted, thin-cut, smothered in cheese, or dipped in ketchup, French fries are a mouthwateringly delicious treat. Without further ado, sink your teeth into the best French fries in all 50 states. The pomme frites at this French bistro are beloved for a good reason. The hand-cut, shoestring potatoes are blanched and then fried, making them the perfect salty accompaniment for the Croque Monsieur (ham and cheese). Besides burgers, po-boys, and Philly cheesesteaks, Tommy’s Burger Stop serves delicious French fries. Whether you order the Cajun seasoned fries, the chili cheese fries, or the regular cheese fries, you can’t go wrong. Optional sauces like bleu cheese, ranch, barbecue, remoulade, and creole mustard make your fries extra savory. This British-style pub gets top marks in the fry department. Dip the hand-cut tikka fries in a creamy, spicy tikka sauce for British-Indian potato bliss. For an even richer (and messier) option, go with the melted cheddar cheese fries or the poutine, which adds gravy and cheese curds to the melted cheddar fries. Big Orange’s sweet potato fries (which are served with mango-curry ketchup) and truffle fries (with white truffle oil, garlic, herbs, and aioli) are killer, but the real star is the State Fair Fries. Topped with beef chili, cheese dip, pickled and fresh jalapeños, and red onion, these French fries combine classic American flavors with delicious results. With a few locations across the city, Plan Check has Angelenos covered when it comes to fries. The restaurant’s beef tallow fries are served with simple smoked salt and ketchup. To switch things up, order the sweet potato waffle fries, which come with peach ketchup. Steuben’s gravy cheese fries aren’t for the faint of heart. After the potatoes are fried, they’re coated in a peppery gravy and cheese. Although the fries are an appetizer, the portion is enormous. Start your meal at the Black Rabbit Bar & Grille with a bang by ordering a plate of the house fried chips. The tasty fries come with truffle oil, shaved parmesan cheese, and a garlic herb aioli. This pub is so popular that it has multiple locations in Delaware and Pennsylvania. On the late night pub menu, order one of Two Stones' famous fry piles. The hot and spicy fries come with hot sauce, shredded cheese, bacon, and scallion; for dessert, the cinnamon-sugar sweet potato fries are served with vanilla bourbon cream and maple molasses syrup. The first Char-Hut opened in 1976 in Miami, and today the small chain has tons of fry options, from sweet potato to chili to cheese fries. The standout, though, is the Messy Fries, which are topped with hot, liquid-y cheddar cheese and chili. Illegal Food’s classic hand-cut potatoes are fried, sprinkled with salt and pepper, and served with a house-made apple catsup. But you can get a lot more creative: Between French onion dip, Sriracha honey, and Okonomiyaki-style fries, opt for the Okonomiyaki. You’ll get fries with Japanese mayo, fermented chili sauce, shredded nori, and bonito flakes. Doumo arigatou, Illegal Food! You can get just about any kind of hot dog at Hank’s Haute Dogs, but you won’t want to miss the French fries. Fresh cut Castle Rock potatoes (skin on) are double fried in beef fat to create a rich, crispy delight. Dip your fries in the chipotle mayo, wasabi crème, or curry ketchup sauces for an extra kick of flavor. 12. IDAHO // BOISE FRY CO.
For its French fries, Boise Fry Co. fries potatoes from Buhl, Idaho in GMO-free sunflower oil. Although you might think it’s blasphemous that their fries are unsalted, the dipping sauces more than make up for it. The variations in potato, cut, and sauce are endless, but some options include russet, yam, purple, gold, curly, shoestring, and blueberry ketchup. Although you can certainly order a side of Au Cheval’s fries plain, why not put an egg on them? These crispy fries, served during brunch, are drizzled with a Mornay sauce (creamy cheese), topped with a fried egg, and served with garlic aioli. The Scratch food truck drives around Indianapolis, selling scrumptious fries to locals across the city. The Poutine de Peru Fries are tossed in a spicy Peruvian yellow pepper sauce with queso fresco and topped with cilantro. This French brasserie-style restaurant offers duck frites and poutine appetizers. With the frites, you get a Béarnaise sauce, harissa aioli, and curry ketchup. The poutine is seriously rich, with braised beef, cheese curds, mushrooms, caramelized onion, and an optional fried egg. What’s one way to make the live music at The Casbah even better? Add delicious French fries, of course! Whether you order a basket of truffle, sweet potato (with cinnamon sugar seasoning), bacon cheddar cheese, or poutine fries, you’ll be rocking. And don’t miss out on the duck fat fries, which are tossed in duck fat butter, herbs, and orange zest. Start your meal at Rye with the triple-cooked fries, which are fried three times for extra crispiness and come with a refreshing chile-lime aioli, perfect for dipping. Although you can order more exotic dishes at this gastropub and wine bar (frog legs, anyone? ), the pommes frites are striking on their own. Fried in goose fat, the fries come with malt vinegar aioli and a spicy peanut satay dipping sauce. This café (which is aptly named) fries their hand-cut Belgian fries in duck fat, creating a rich flavor. The tastiest dipping sauces are the Thai chili mayo and curry mayo, but the horseradish mayo and truffle ketchup are close seconds. With three locations in Ocean City, Thrasher’s has specialized in French fries since 1929. Famous across the country, Thrasher’s fries are simmered in peanut oil and dipped in apple cider vinegar. Saus’s logo includes a cone of fries, so you know you’ve come to the right place. If you want to sample a bunch of different fries, order the petite size and eat to your heart’s content. The hand-cut, aged Idaho russet potatoes are fried twice and come with your choice of dipping sauce, ranging from Samurai (chili paste and mayo) to Saturday Night Chive (chives and sour cream) to Vampire Slayer (roasted garlic, garlic oil, and mayo). Whether you’re eating brunch or dinner at this Detroit restaurant, you’ll want to get a side of the frites—they come with the house mayo, a creamy dipping sauce that contains pickle juice. The Rabbit Hole’s take on Korean street food is sure to leave your taste buds happy. Order the Harold & Kumar Poutine (available on the lunch menu) to get house cut fries, a soft poached egg, kimchi caramelized onion, pork curry gravy, parmesan, cheddar, and chipotle aioli. This oyster bar’s menu has a tasty selection of small plates with big flavor. The gravy fries are served with roast beef gravy, gruyére cheese, and pickled chiles. A side order of the bistro fries at The Kitchen Sink will land you a perfectly tasty batch of salted fries (skins on). But the dirty fries (served with beans and melted cheese) and the sweet fries (sweet potato fries with melted marshmallow and brown sugar) are even more decadent and satisfying. Since 1991, the Iron Horse has served salads, sandwiches, and burgers to hungry Missoulians. The restaurant's delicious fries (regular or sweet potato) are seasoned with either garlic parmesan or a spicy blend of seasonings. This renowned restaurant in downtown Omaha sells Dragon Fries, a basket of fries with cheese curds, spicy sauce, scallions, and a crushed fortune cookie sprinkled on top. If you’re in a carnivorous (and creative) mood, order the Duck Duck Goose Fries to get a basket of fries with duck confit, mayo made out of duck fat, and a gooseberry gastrique. In the heart of the Las Vegas Strip, you’ll see PBR Rock Bar & Grill (PBR stands for Professional Bull Riders). Although the DJ booths, four bars, and hydraulic mechanical bull might entice you to visit this huge restaurant, the Bucking Bull fries will keep you coming back. Start your meal with the fries, which come with cheddar cheese sauce, bacon bits, sautéed onions, and Buffalo sauce. The Local’s fries go well with their burgers and sandwiches, of course, but they're also delicious on their own. Dip the regular fries in a spicy ketchup, the sweet potato fries in a honey mustard sauce, or order the crispy garlic parmesan fries, which are covered in garlic butter and parmesan cheese. You can order a side of plain fries at this famous hoagie shop, but the best way to eat them is in a sandwich. Some of the massive sandwiches, with names such as Phat Lady and Mac Daddy, thankfully come with fries in them. Make sure to dip your fries in Hoagie Haven’s Sanchez sauce, which tastes sweet like honey mustard and spicy like hot sauce. Named after Route 66, this 1950s-themed diner serves classic burgers, milkshakes, and a selection of fries. The soda fountain and jukebox will get you in a retro mood while you wait for the cheddar fries, fiesta fries (with chili and cheese), or the 66 fries, which are swimming in chopped green chile and queso. You might not expect to see French fries on the menu of a noodle and southeast Asian street food restaurant, but King Noodle delivers in the fry department. Szechuan peppercorns make the Mapo Chili Tofu Fries spicy, and the tofu, scallions, and cheese make the fries look like a piece of art. This watering hole has an impressive selection of Belgian beers and an equally impressive food menu. The poutine takes the restaurant’s house-cut French fries to another level: Wisconsin cheese curds, crispy house-cured pork belly, a sunny side up egg, beer gravy, and scallions round out the dish. In downtown Fargo, you’ll find this restaurant that serves duck fat fries. These fries are oozing with flavor, thanks to the gruyere cheese, crème fraiche, and duck bacon. Order the fries with another popular appetizer, the lobster corn dogs, and your stomach will be quite content. Celebrity chef Michael Symon’s bistro in downtown Cleveland serves Lola Fries as a dinner side. They’re thin-cut, blanched, rinsed, frozen and then fried in pure lard with heads of garlic. When they're fresh out of the fryer, they're seasoned with rosemary and sea salt. You can get the house cut sweet potato fries at both of Yokozuna's Tulsa eateries (a third location in Oklahoma City is coming soon). Before you order your noodles or sushi, you’ll want to whet your appetite with these fries, which are battered in tempura and served with a chili soy sauce and wasabi mayo. This food truck parked on Hawthorne Blvd. is a French fry lover's paradise. The potatoes are fresh cut, double fried, and served with unusual sauces ranging from tarragon anchovy mayo to rosemary truffle ketchup to bourbon honey mustard. You can’t go wrong with the vegan poutine, palak paneer fries (with curried spinach, paneer, and cilantro chutney), or the PB & J fries (topped with satay sauce and chipotle raspberry jam). This Belgian beer emporium serves award-winning pommes frites made with locally grown bintje potatoes (which are popular in Belgium and France). They’re fresh cut, double fried, and accompanied by delicious bourbon mayonnaise dipping sauce. After trying the sweet potato burger, you’ll know that this Providence spot knows its potatoes. You’ll be happy whether you order the old bay fries with Tabasco mayoli (mayonnaise aioli) or the fez poutine bowl. Before you bite into your sandwich at Tattooed Moose, you’ll want to start with a basket of duck fat fries, which come with homemade garlic aioli. Go to the next level by ordering the roasted garlic and bleu cheese fries, which add bleu cheese fondue sauce and garlic confit to the duck fat fries. The fried chicken at The Keg is legendary, but the classic French fries deserve just as much recognition. These simple, no-frills frites will put you in French fry heaven. If you’re extra hungry, get a half pound (or full pound, we won't judge) order of the spuds. If you love waffle fries, you’ve come to the right place. M.L. Rose’s specialty bleu cheese waffle fries are great, but the Carolina Sweets are also a standout. These sweet potato waffle fries are topped with pulled pork, green onions, and Carolina mustard barbecue. If you find yourself in Houston’s Montrose neighborhood, head to Lowbrow for the curry fries. These hand-cut fries feature spicy masala curry, feta cheese, pickled shallots, jalapeños for extra kick, and cilantro. If you want to turn them into a full meal, you can add grilled chicken, fried tofu, or shrimp. If you love Korean barbecue, you must check out Bumblebee’s BBQ & Grill. One of their best sellers, the KPOP fries are topped with your choice of bul-gogi, spicy pork, or spicy chicken as well as jalapeño mayo, green onion, shredded cheese, and Sriracha. Use a napkin (or two), because the KPOP fries are mouthwateringly good. Al’s French Frys won the James Beard Foundation’s “America's Classics” Award, and for good reason. Made with Idaho or California russet potatoes, the fries are cooked in beef tallow and soybean oil. They come in a cup, pint, or quart, and you can add cheese sauce, gravy, or chili to them. If you’re searching for addictive truffle fries, head to Citizen Burger Bar. With additional locations in Richmond and Arlington, Citizen Burger Bar offers hand-cut French fries that are made in-house every morning, fried in peanut oil, and served with truffle oil, parmesan, garlic aioli, and chives. This sustainable butcher shop in West Seattle cooks burgers, pulled pork sandwiches, and grilled cheese. Their hand-cut swine fries—which are fried in rendered pork fat and tossed with salt, green onion, and fresh garlic—are delicious, but the Danger Fries take it to the next level: They're topped in a bacon blue cheese béchamel sauce. If you’re not in the mood for burgers or wings, order the Sriracha cheese fries at Maloney’s. These spicy frites are baked with cheese, red onion, and jalapeños, making them a satisfying blend of salt, heat, and crunch. Although North Ave Grill’s wraps, omelets, and burgers come with fries, you’ll want to focus your taste buds solely on the diner’s loaded spuds. The hand-cut fries are cheesy, salty, and savory—melted cheddar, pepper jack, bacon, sour cream, and green onions make these fries a satisfying meal. At this downtown comfort food spot, you can get pizzas, burgers, and fries—but the Pad Thai fries are truly one-of-a-kind. The Thai-inspired appetizer consists of fresh cut fries, red pad Thai sauce, green onions, chopped peanuts, and lime.